My first day on skis this season was a quick scoot around Courmayeur’s pistes in Italy’s Aosta valley. That was after a great ride up the two-stage Skyway Monte Bianco cable cars. These are circular with floor to ceiling windows and rotate while in motion to make the most of the mind-blowing views. They whisk you up 2166m to Punta Helbronner at 3466m in about 20 minutes. 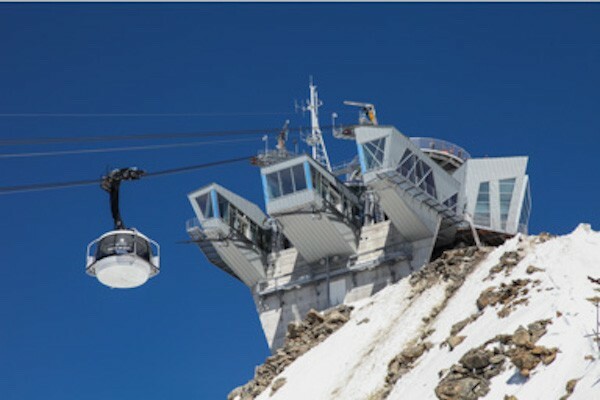 At the top the, 360º views of hundreds of famous mountain peaks including, of course, close up vistas of Mont Blanc and more distant ones of the Matterhorn. At the top there’s a bistro, viewing platforms, including one with a glass floor, and fantastic displays of crystals. Punta Helbrunner is the starting point for epic off-piste runs – look out for more on them from Nicky Holford who is joining me on this trip. The mid-station of Pavillon is much bigger than the top station and includes a restaurant, cinema showing the amazing feat of constructing the new cable way (which opened in 2015), viewing platform, shop, winery and botanic garden (covered in snow in winter). After that, I met Reberto, my ski guide for a tour of Courmayeur’s pistes. This confirmed the long-held WTSS view that the ski area suits good intermediates best, with some excellent challenging red runs – my favourites were the highest piste (Youla) from the eponymous cable car and the continuation of this (Comba Moretta) to the Gabba chairlift. The snow on both these runs was natural (no snowmaking there) and in great condition. A handful of runs were closed through lack of snow, including a couple of blacks and the run down to the valley at Dolonne. Nevertheless, we skied nearly all Courmayeur’s other runs in less than two and a half hours – confirming WTSS’s other long-held view that the ski area is very limited in extent. But that doesn’t put off visitors enamoured by Courmayeur’s village charm, especially its delightful car-free Via Roma, lined by tempting shops, bars and restaurants. Once again, we were enchanted by the village too. This was the first stop on a tour of all the main resorts in the Aosta valley. Next come La Thuile, Pila, Cervinia and Champoluc.